Vetstreet.com offers great info for pet owners. Here is one on a very common dog behavior. Enjoy! It’s not hard to imagine why a loyal dog might stare devotedly at his master. It’s the stuff of Old Yeller, White Fang and Lassie –– starers, all. But some dogs take staring to extremes, following their owners around with baleful eyes as if expecting links of sausage to fly from their human’s fingertips. Let’s face it: Dogs love their owners, but when they stare expectantly, it’s not usually because they’re trapped in a reverie of devotion. Rather, it’s because they’re thinking they might get something. And usually, that “something” involves a tasty snack. 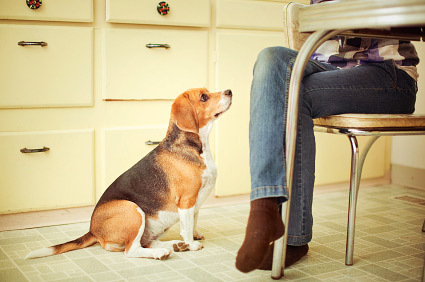 But dogs can—and do—stare at their owners for plenty of non-food issues, too. Indeed, anything a dog might want that a human can provide could be the source of the staring behavior, from a fun game of fetch to a ride in the car or a long run. Then there’s the possibility that a dog is simply seeking attention in any form, or perhaps she’s merely waiting for praise or direction. Some dogs may just be trying to read an emotion in our human facial expressions. In any case, staring is typically considered to be a good thing. In fact, most trainers encourage dogs to stare at their owners while awaiting their cues. And if you’ve never done it, gazing deeply into a dog’s eyes can be a highly rewarding pastime. Before you try it, be aware that staring directly into a dog’s eyes can be considered a direct challenge. That’s why mutual staring is an activity that’s only to be encouraged within the context of a healthy dog-human relationship unsullied by any taint of aggression or behavioral abnormalities. Why Does My Dog… Eat Poop? Why Does My Dog… Lean on Me?